It might sound odd for the author of a blog on how best to use consumer technology in veterinary practices to be writing about employee satisfaction, but it really isn’t. One of my favorite B-school professors said that the focus on information technology (IT) should be much more on information than technology. Technology is a tool that people can use to be more productive and get better results….but people have to use it. Which brings me to something another B-school professor said: it’s all about the talent. I’ve written previously about a wonderful little book about management of human hospitals, but the principles espoused in the book apply equally well to veterinary practices. 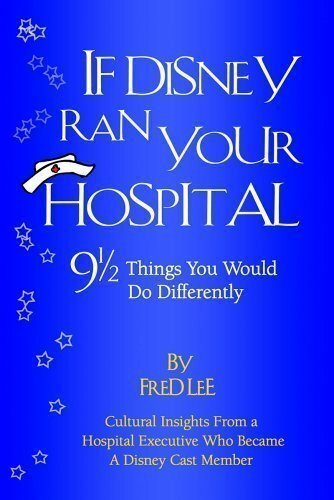 It’s called, “If Disney ran your hospital: 9.5 things you would do differently”, and the penultimate chapter has a fascinating section on employee satisfaction. The author, Fred Lee, makes a very interesting statement: “I did not get the impression that Disney existed to satisfy employees. Employees existed to satisfy Disney guests….There was no tolerance for employees who deviated, even slightly, from cultural norms. Behavioral standards were exacting and strictly enforced.” Think about that for a bit and let it sink in…this runs counter to what you hear from most human resource folks. “Make your employees happy and they’ll make your clients happy.” Sound familiar? What if that’s backwards? Don’t get me wrong; Disney spends a lot of time and money getting exactly the right people to work there. Their interview process is demanding and they have a fantastic brand that keeps the pool of applicants very full. But like other companies where customer satisfaction is legendary (Zappos and Amazon.com come immediately to mind), Disney doesn’t pay very well. Nor do they have outstanding benefit packages or other lavish employee perks. How can that be? The answer is that these companies focus on finding self-motivated people who are enthusiastic and enjoy taking care of their customers. They have intrinsic motivation: they’re not in it solely for a paycheck or benefits. What if employee satisfaction is one of those fleeting goals that, like happiness, never seems to come to those who actively seek it? What if satisfaction is a by-product of doing your job well? Client impressions should always come first because they are an important driver of client loyalty, which is another topic I’ve written on extensively. Each member of your team has incredible power to either add or destroy value with each client interaction. There are a number of great resources for those of you who need help implementing new client service protocols or simply want to jump-start existing systems. I’m a member of VetPartners, which is a group of many talented and insightful individuals serving our great profession. Start at their website (www.vetpartners.org) and ask around. Good luck!